The wonderful world of Pilates has so many benefits, including the ability to shape and streamline your legs. Before we get into the leg workout specifics, let’s first cover what makes Pilates so amazing and how to utilize your Total Gym equipment to transform your body using Pilates. Pilates is challenging both mentally and physically. A strong focus of Pilates is aimed to work the smaller, intricate muscles at the joints to facilitate optimal movement all while paying particular attention to proper body alignment. In essence, this is all part of the whole-body health relationship to connect the mind with the body. It takes practice and knowledge to learn the method properly, but by adding basic movements to your routine, you will be able to perform exercises that will help you function better in everyday life. There are countless ways to perform Pilates exercises on your Total Gym. It’s very similar to a Pilates reformer, however gravity will be the resistance factor rather than springs. Adjusting the incline will provide your body with the acceptable resistance challenge it needs to perform specific exercises. Glide Board: The surface of the glide board allows you to comfortably and efficiently position your body to perform exercises correctly. It can be used as a feedback mechanism for proper alignment. Also, the incline setting allows gravity to assist or resist by making body weight exercises easier or more challenging to accomplish. Cables: The cables attach to the glideboard to perform a variety of Pilates exercises for upper body and core strength in all ranges of motion. Foot Bar: The foot bar attaches to the base to perform a variety of Pilates series using gravity as resistance. Platform: The standing platform attaches to the base to perform standing, kneeling, or lying Pilates sequences. Single Leg Pulley: The single leg pulley system attaches to the tower. One end connects to the glide board and the other end clips into the ankle strap of the working leg. This accessory allows each leg to work separately in different positions and in all ranges of motion. Double Leg Pulley: The double leg pulley accessory enables you to perform a full range of cable-based leg exercises and stretches bilaterally. Whether you utilize these accessories or other fitness props, the Total Gym will provide you an excellent Pilates Reformer style workout! The Total Gym Leg Pulley System is the highlighted accessory for this blog. Therefore, it’s essential to discuss it further so that you understand the importance of how it benefits your body and not just learn some good moves for your legs. Building strength around the surrounding muscles of the hips by using body weight and gravity as resistance. Developing stability of the core, hips, and knees by strengthening smaller muscles around these joints. Ultimately preventing injury and promoting optimal performance with all activities in life. This workout focuses on utilizing the single leg pulley attachment to obtain long, lean, and sculpted legs. ATTACH THE SINGLE LEG PULLEY SYSTEM- Anchor the Total Gym Leg Pulley Accessory to the tower. Attach the ring to the hook under the glideboard. Hold the opposite end while you position your body on the glideboard and then clip the Leg Pulley to the foot harness ring of the working leg. INCLINE- The incline height is based on individual strength and as well as keeping proper body alignment throughout the exercise. A lower incline is still challenging and can allow you to maintain proper body awareness throughout the exercise. Explore the best incline for your body, but focus on core stabilization to support body alignment so that strength and flexibility occur. Perform the following exercises for 10 REPS on each leg, once through. *I recommend performing each series on one leg, then immediately repeat it on the other side before moving to the next grouping series. 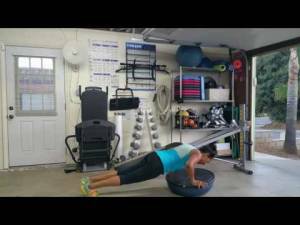 Targets: challenges core strength and pelvic stability while strengthening hip mobility. Positioning: attach the cable to the front of the ankle strap. Hold onto the cable as you lie supine facing away from the tower. Once in position, release the cable and extend both legs at 90’ to begin the exercises. Windmills- alternate scissor legs 3xs, then half circle them around. Leg circles- make small circles in each direction. Progress to larger circles. Frogs- externally rotate and extend the legs to 45’ with the heels touching. Keep the heels together as the knees bend and extend. Targets: tones and strengthens glutes, hips, and thighs through core stabilization. Positioning: attach the cable to the side of the ankle strap. Hold onto the cable as you lie on one side with the attached leg on top and the head towards the tower. Once side lying, release the cable, extend the legs long, and stack them at a slightly forward angle begin the exercises. Circles- make small circles in each direction. Progress to larger circles. Change the circle angle to work in different ranges of motion. Targets: tones and strengthens the glutes, hamstrings, core stability, and dynamic hip mobility in all angles. Positioning: attach the cable to the back of the ankle strap. Hold onto the cable as you come onto all 4’s (quadruped) facing the tower. Once kneeling, release the cable and extend the leg long. Keep both arms extended, spine straight, and hips level though out the exercises. Hamstring Extension & Kick Back- extend the leg at hip height. Bring the heel to the glute and extend, then bend the knee towards the core and extend. Alternate this motion. STRETCH: End your Pilates session with a series of stretches that lengthen the muscles worked, prevent injury, and get you ready for your next workout. Please check out the video to see how these Pilates exercises are performed utilizing the leg pulley attachment on your Total Gym. Pilates movements are challenging, but are useful for proper body alignment and core control. It also encourages gracefulness through the art of movement. Let these Pilates exercises speak to your body and change the way you sculpt lean legs using the Total Gym Leg Pulley Attachments.